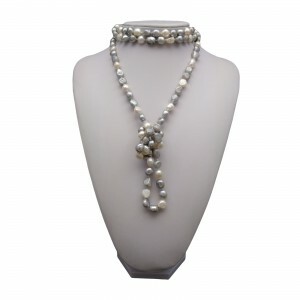 In our shop you will find strands of pearls with different length : from 160 cm to 200 cm. Please note that all strands are knotted, between all pearls is tightened tied knot so next pearls do not touch each other, and the whole cord is beautifully arranged. You can easily wrap them around the neck three times and arrange them in any way. You can also tie as a strap or even a bracelet. In Warsaw, the knot costs from 0.90 to 1.50 PLN. for one item, which determines the attractiveness of our prices. The colors and the variety of shapes we are presented in the pictures, and more detailed descriptions You can found in descriptions of individual pearls. Supplemented 160 cm necklaces. We choose them personally because we care about the best quality of t.. Supplemented 160 cm necklaces.We choose them personally because we care about the best quality of th.. Supplemented 160 cm necklacesWe choose them personally because we care about the best quality of the.. Supplemented 160 cm necklacesWe choose them Personally, because we care about the best quality of th.. Supplied with 200 cm necklaces.We choose them personally because we care about the best quality of t..